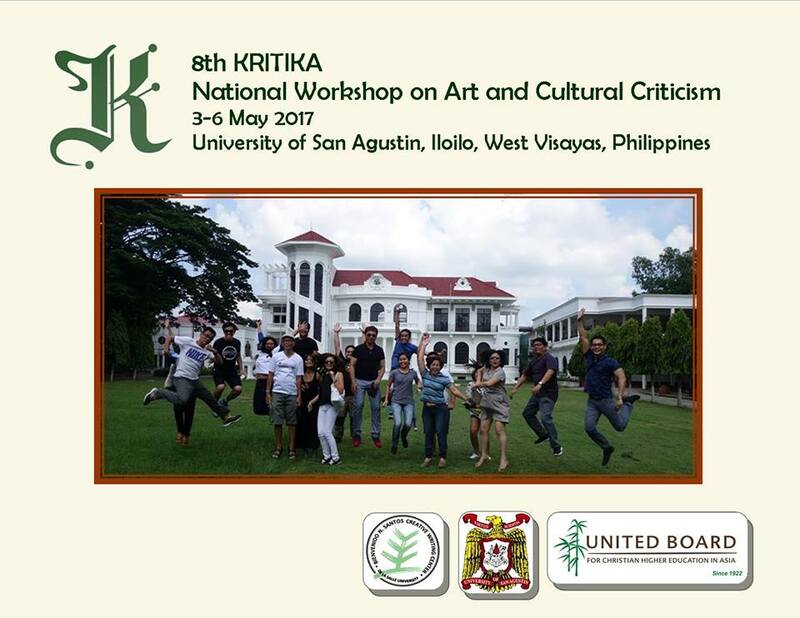 The Bienvenido N. Santos Creative Writing Center (BNSCWC) of De La Salle University-Manila is inviting young critics and scholars to apply for fellowship to KRITIKA 2017: National Workshop on Art and Cultural Criticism. It will be held on 3-6 May 2017 at the University of San Agustin (USA), Iloilo, West Visayas. Dr. Rolando B. Tolentino, esteemed cultural studies scholar and BNSCWC Associate for Criticism, is workshop director. KRITIKA is envisioned to give young scholars who want to commit themselves to art and cultural criticism a forum where they could discuss their work and concerns with established art critics and culture experts in the country. The workshop focuses on critical writing in the following arts and cultural practice: literature, architecture, theatre, film, dance, music, visual arts, multi-art, and popular culture. For 2017, fellowships will also be given to food criticism and writing on heritage. Manuscript should be an unpublished critical essay. It should be on work by Filipino artist/s. A study may choose to examine more than one art form. Manuscripts in a regional language (e.g., Cebuano, Hiligaynon) are welcome and must be accompanied by an abstract in English or Filipino, or a translated version in English or Filipino. Ten applicants will be chosen for the fellowships, which include transportation stipend and board and lodging. Interactions with local artists and an Ilonggo food and cultural heritage tour will supplement the workshop sessions. Interested applicants should address their application to: KRITIKA 2017, Bienvenido N. Santos Creative Writing Center, De La Salle University, Manila. The application should include a cover letter (with complete contact information), an unpublished critical paper, and curriculum vitae with photo. Application may include a sample published work. Please send to: bnscwc@dlsu.edu.ph. Deadline for application is 15 January 2017. Applicants selected for the fellowships will be notified by mail in February 2017. KRITIKA is organized in partnership with the USA Center for Research, Innovation and Development and the Fray Luis de Leon Center for Creative Writing. It is supported by the DLSU Office of the Vice Chancellor for Research and Innovation. The food writing fellowship is sponsored by the DLSU Angelo King Institute for Economics and Business Studies. KRITIKA is part of the program Reliving Heritage: Fora and Workshop on Philippine Art and Local Cultures, a forum series and workshop on appreciating Philippine art and cultural heritage in light of the evolving history of Philippine higher education, funded by the United Board for Christian Higher Education in Asia. For inquiries, please contact BNSCWC at (632) 5244611 local 233, or email bnscwc@dlsu.edu.ph.